When I was growing up my Mum had this thing about getting as much omega 3 in me as possible. I’d known for a long time that I wanted to do something in the City – the plan was to be a career woman – and it wasn’t going to happen without getting good grades. So from SATs onwards my Mum began plying me with omega 3 in the form of brain boosting tablets and lots of oily fish! Fortunately for me I love fish! 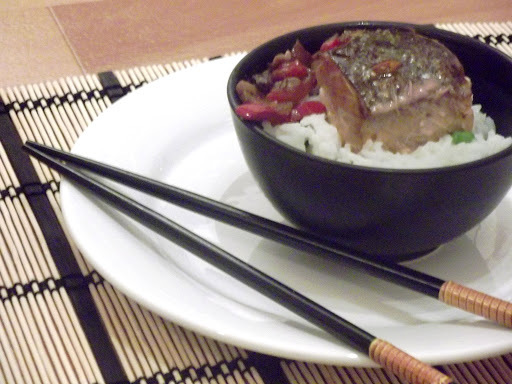 Week in, week out we would have salmon in some form – sometimes twice! I must know a hundred and one ways to cook salmon. This one is slightly different. It’s hot and spicy yet sweet at the same time, and the steamed rice and peas brings a whole lightness to the dish to balance it out. When I was growing up this was my favourite way to have salmon as it was the most exciting way that my parents would cook it. You can only have baked salmon and new potatoes so many times! If I was really lucky my Dad might come home from work with little extras like prawn crackers or spring roles. Dad’s way of treating us has ALWAYS been with food! If we had a curry he might bring home poppadums, samosas or onion bhajis when he was in a really good mood! Even without the little extras though, this recipe packs a punch with the heat from the chilli and the zing of the lemon. For those of you who have resolved to cook more exciting things from scratch, this will certainly jazz up a normal weekday meal. Pour the soy sauce, sugar and lemon juice into a jug and add the chopped chilli, ginger and garlic. Give it a good stir and put to one side for later. 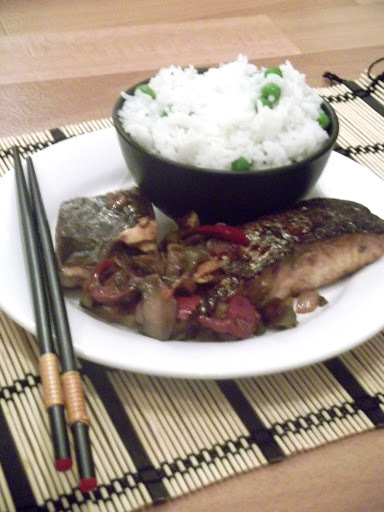 Stir fry the peppers and mushrooms with the spring onions then place the salmon in the pan skin side down. Pan fry the salmon in this way for 10mins until the skin is crispy. Add the sauce into the pan and allow to simmer. 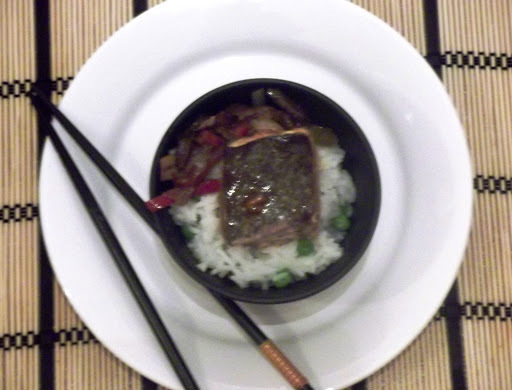 While the salmon is cooking, place the peas and rice into a pan of boiling water. Bring the water to the boil and then cover and allow the rice to soak up the water. Cook the fish and vegetables in the sauce until the sauce begins to reduce down. Turn over the salmon and spoon over the thickened sauce. Cook the salmon for another 5mins (or until cooked through) spooning the sauce over regularly so the skin is crispy and glazed.